The most probable outcome of the FOMC meeting currently under way is the continuation of "Operation Twist" and possibly the extension of the current “exceptionally low… through late 2014” rate guidance to "mid 2015." Other policy changes are much less likely. A drop in the rate paid on bank reserves is possible but not preferable because it could destabilize money markets functioning (potentially pushing repo rates deep into negative territory with a sharp drop in liquidity). A UK style policy to lend to banks below market rates (to encourage lending) is also unlikely because of legal limitations and political ramifications of the Fed lending to banks again. And there is almost no chance that any sort of unsterilized asset purchases (QE3) will be announced. The Fed should be quite happy with the impact of the Maturity Extension Program (Twist). The central bank has taken a considerable amount of duration out of the treasury market. This happened just as demand for treasuries rose due to escalating problems in the Eurozone as well as negative rates in the "safer" European nations. This combination has created the most accommodative long-term rate environment in recent US history. 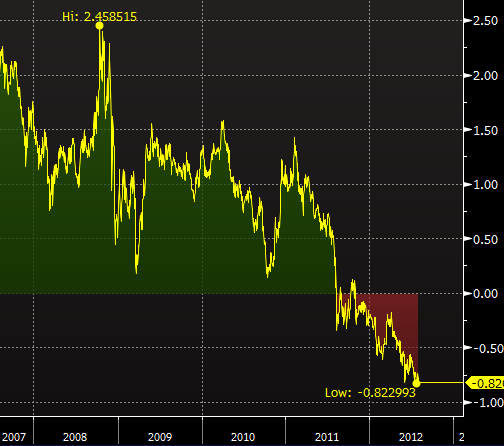 The 10-year zero coupon real yield is at record low of negative 82bp. Many would argue that this extraordinarily accommodative policy is not feeding through to the economy. But there is very little the Fed could do about that other than possibly shifting to MBS "Twist" (which is a distinct possibility down the road). Increasing bank reserves via QE3 will NOT make conditions any more accommodative than they already are. That's why Twist, and later sterilized purchases (which may at some point involve nontraditional sterilization techniques such as issuing Federal Reserve bills), will continue to be the primary tool for easing.